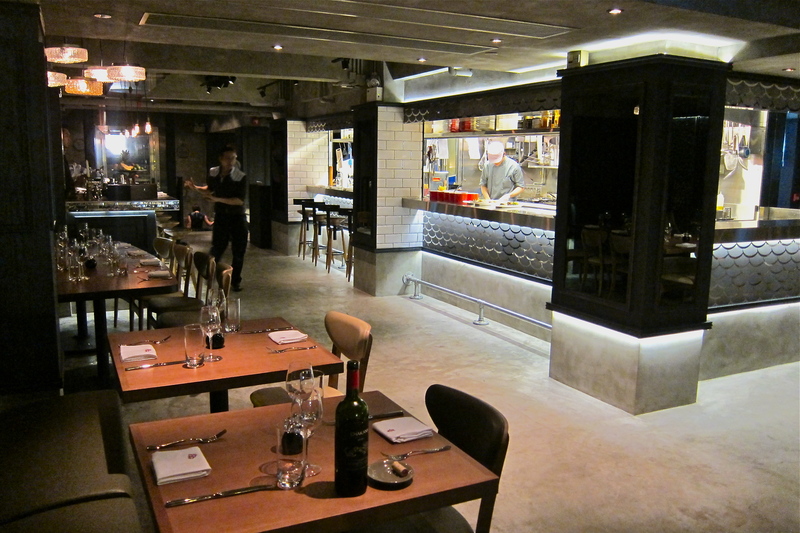 Gals and Gents, I present to you the newest addition to LKF’s restaurant scene: Sal Curioso! As you enter the restaurant and climb up the stairs from Glenealy Street, the delicious smell wafting from the kitchen is irresistible. Think of it as a bright orange carrot, and you are most definitely the horse – watch those steps, you might very well trip as you’re rushing up them! Sal Curioso is the second restaurant by Woolly Pig Concepts, which also opened Madame Sixty Ate. The concept is based on a fictitious gourmet personality, Sal, who travels (curiously) around the globe, his main motivation: food! He must have settled in Latin America, as the restaurant offers up dishes predominately (but not exclusively) inspired by Latin American cuisine, with a twist! There have been no comments on Open Rice, no blog posts to research beforehand – as far as I know, this is the first! And so, we went to this restaurant with zero knowledge, our excitement levels high and our taste buds excited. As you enter the restaurant, you are immediately greeted by the cocktail bar to your right, and the large open kitchen to your left. Similarly to Madame Sixty Ate, you have a completely open view of the inner workings of the kitchen, and it feels like an intimate experience. The interior space feels open, well laid out, the tables are well-spaced (I hate eating elbow to elbow with the someone at the neighboring table). The scene is set, the diner is comfortable and ready for the opening act. 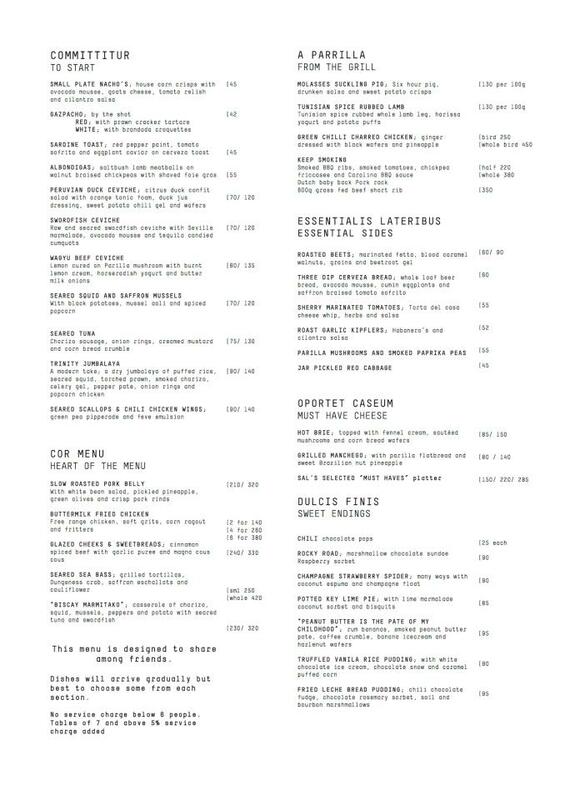 The menu was designed by Chef Director Chris Woodyard, also CD at Madame Sixty Ate, and ex-culinary director of the W Hotel Hong Kong. When I booked the table, I was informed that the menu is meant for sharing, but seeing as it was a date night, more people was not an option – we would take our chances. The menu is partitioned into starters, the ‘cor menu’ (heart of the menu), Parrilla items (from the grill), sides, cheeses and desserts. For many of the dishes you are given the option of ordering a small or large serving. We wanted a little bit of everything, and you will find that even if you go as a couple, this menu works just as well for sharing between two as it does for four or more. The first item on the menu: it sounded so appetizing that it had to be done, and what we were served was deconstructed, unconventional and surprising, and yet so satisfying and moreish! I would have to say that these are the most original nachos out there – throw out the nacho-corn chips, the salsa, the guacamole and the sour cream, add house made pork/corn puffs that look like bar snacks and taste like crackling, a smooth mousse of avocado and cheese, and (I must say) wonderful tomato and red pepper salsa – and this is Sal Curioso’s version of nachos. We were ready for more! 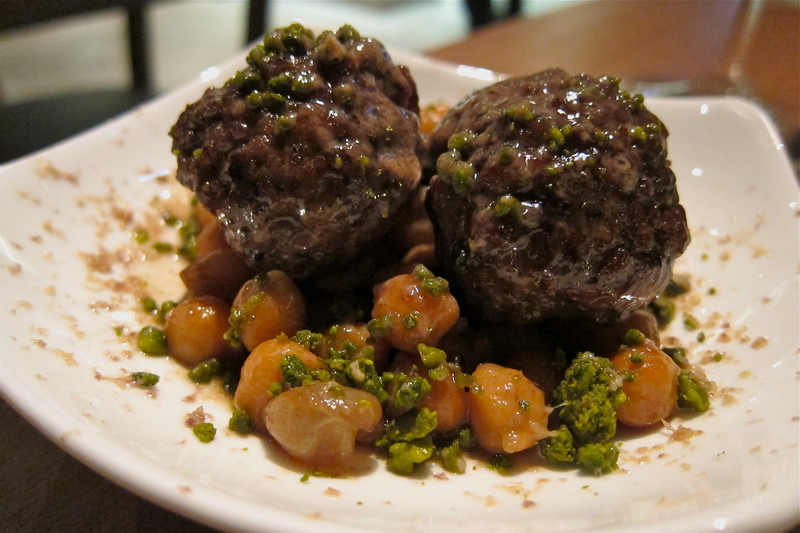 Albóndigas are Latin American or Spanish meatballs, and these were cooked to perfection! Moist, succulent, and so flavorful. 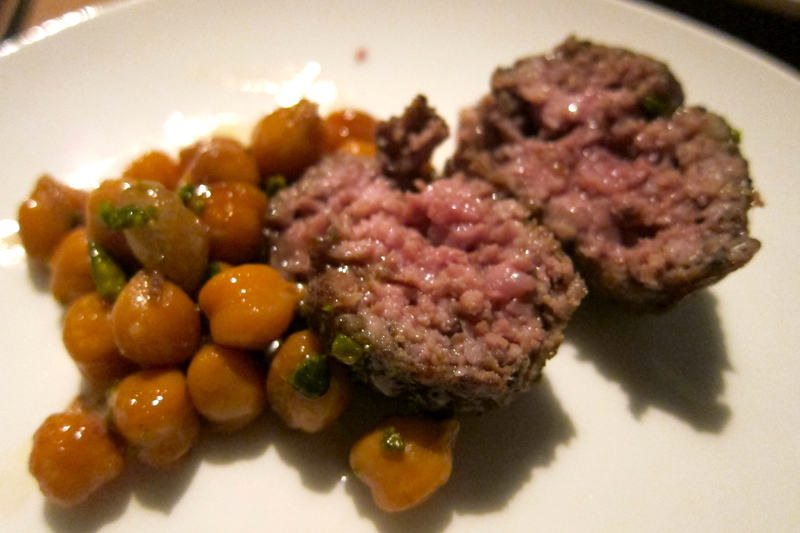 I am a big lover of lamb, and to have that intense favour paired with the richness of fois gras and the delicately braised chickpeas really hit the spot for both of us – I would say that this was one of our favorite dishes. I must applaud Sal for the taste complexity of this dish. 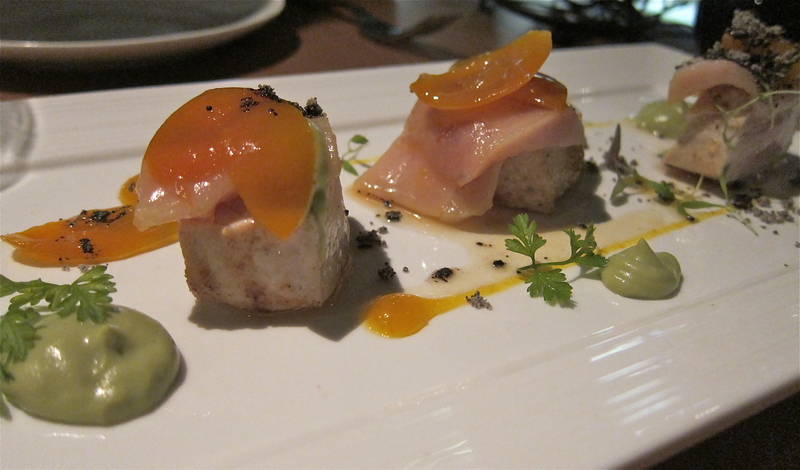 The sweetness of the marmalade, the tartness of the kumquat, the coolness of the avocado and the freshness of the swordfish done two ways was quite lovely. The dried olive powder that is sprinkled on top does not have an overpowering olive taste, yet almost lends an ‘umami’ taste to it. Just look at it – need I say more? Poached pineapple (with a hint of ginger? 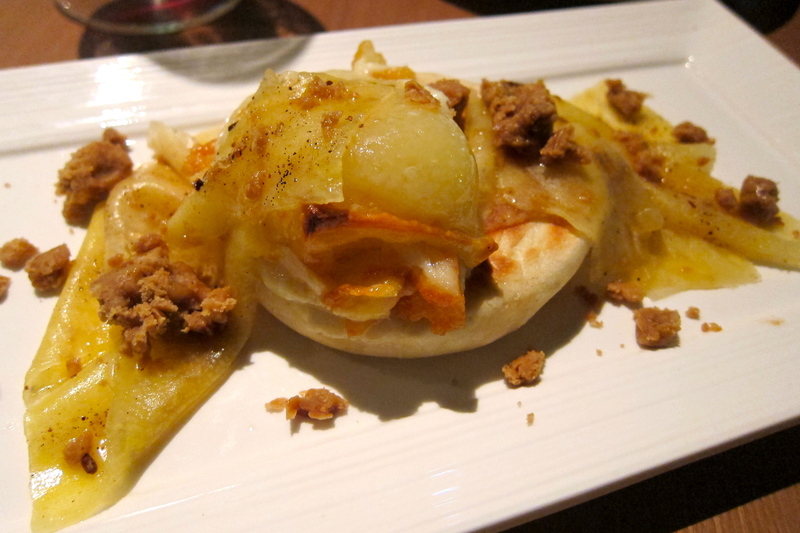 heavenly) and melted manchego on tasted flatbread….! You see that brown stuff sprinkled on top? I can only describe and imagine it to be – cookie dough! We are more intrigued with each dish that is served..
Parrilla is a Spanish surname, the diminutive of Parra, meaning vine bower or trellis (architecture), for example a pergola. Hmmm … we’ll go for the barbecue and skip the course of human torture, thank you! We wanted to order a Wagyu Beef dish on this part of the menu, but when PB and I compared our menus, we found that is was on his, but not on mine. Hmmm, curiouser and curiouser … after inquiring with the waiter, we were disappointed to find that it had been taken off the menu in the last edit! I suppose since it was the soft opening, the Suckling Pig was also not yet available. Oh well, no barbecue for us this time! Again, the sea bass was fresh, light, and cooked to perfection. If you like skin (like me! ), then this was done perfectly too – crispy and well-salted. The addition of Dungeness Crab, while welcomed, was not necessary. This dish would have been just as lovely without it. Comfort food at it’s best!!! There was no Latin-inspired ANYTHING with this dish, but who the hell cares, it was freaking awesome. The batter was light, nicely spiced, sparingly used (don’t you just hate it when you have to fish for the meat amongst all the batter?). Finger-licking (and bone chewingly) good! 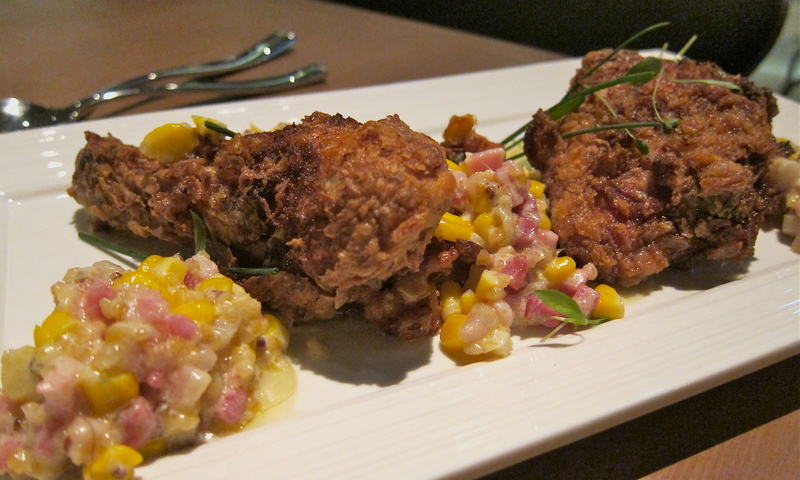 The corn ragout comprised of everything that is wholly not good for you, cheese, ham and fat – but I love it. Hey, if you’re gonna eat something as unhealthy as chicken fried in batter, you might as well go all the way! The side dishes didn’t really live up to our expectation, after everything else that we had enjoyed up to that point. 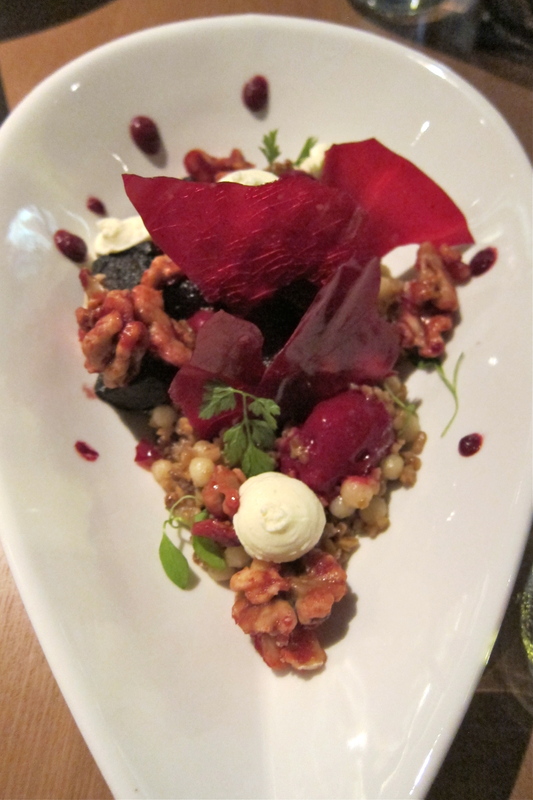 Whilst it was visually very pleasing, I found the roasted beets a little dry, and the grains a bit too breakfast-granola tasting. It could have also been the fact that we were pretty much stuffed to the gills by this point, but this wasn’t as outstanding as the rest of our meal. Similarly, the roasted Garlic Kipflers (potatoes), might have worked well for a larger group, but for the two of us, it was a big portion and we left more than half of it. I didn’t even take a photo! While you could tell that some of the waiters were still a bit green and were being trained, there were a couple (the trainers) that were attentive, informative and not overbearing. 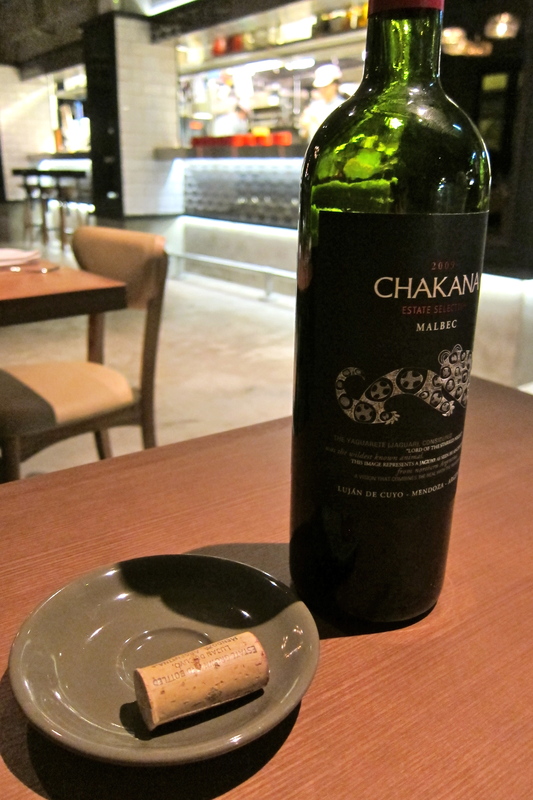 Our wine was presented to us on our table, with the cork by it’s side, as it should be! Our plates were changed between courses, and cutlery was brought to the table on a napkin-lined plate: clean, efficient, well done. Not bad for a new restaurant, although I suppose the real test will be when the restaurant is full, and not just with 4-5 tables to attend to. For a dinner for two with a bottle of wine, it’s well priced for what you pay for, especially relative to other restaurants in the LKF area. We could have also done without the side dishes, which would have bought our meal to a very reasonable $1160. 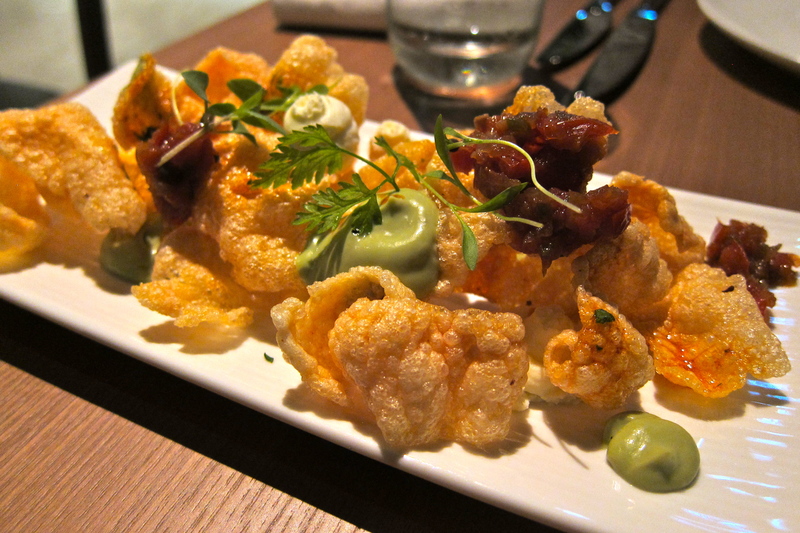 The menu is fun, inviting (we literally wanted to eat everything on it) – some describe the food at Madam Sixty Ate as “whimsical” – well, I certainly would us the same adjective for Sal Curioso. 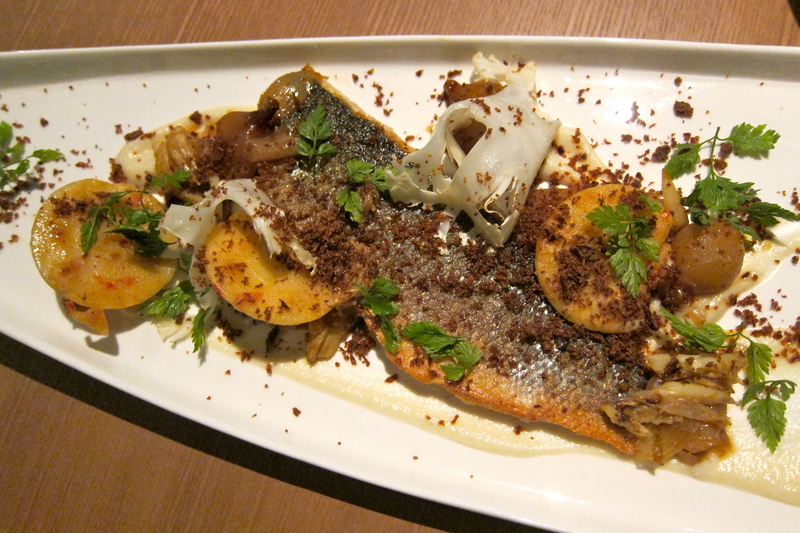 A last mention – Sal has a GREAT terrace overlooking the intersection between Wyndham/Ice House Street/LKF. It was closed when we went because the restaurant has not yet had it’s liquor license approved, but when it opens officially next Wednesday 14th, it will be the perfect place to meet and dine with friends. I was at the Sassy HK event last week. I agree the food was fab! Those meatballs look insanely delicious!